The RANGER 6X6 EFI is a hard working utility vehicle which delivers the payload of a ute with the off-road traction and performance of a premier Polaris off-road vehicle. 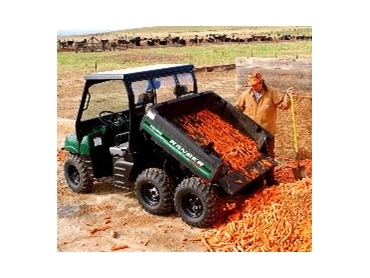 It can go places and carry loads other utility vehicle only dream of. The RANGER 6X6’s work ethic appeals to farmers, contractors and councils that need unmatched capacity and off-road traction. At the core of the RANGER 6X6 utility vehicle is a 40 horsepower, liquid-cooled, even-firing Polaris Liberty 700cc parallel-twin engine. This engine delivers the top horsepower rating for off-road vehicles in the United States and is the reason RANGER 6X6 utility vehicle can carry a class-leading payload of 794kg and towing capacity of 907kg. With quick acceleration and a top speed of 71 kmph, the fastest in the industry, this workhorse can haul. Polaris paired the engine with a Bosch multi-port semi-sequential electronic fuel injection system (EFI). The EFI system constantly and automatically compensates for changes in altitude, pressure and temperature, making the RANGER 6X6 utility vehicle responsive and reliable in the type of rugged, off-road terrain that demands sudden and extreme changes in both power requirements and variations in speed. A Throttle Position Sensor (TPS) in the EFI system ensures the engine delivers extremely precise driver response. Along with being the hardest working utility vehicle, it is also one of the smoothest riding due to true on-demand six-wheel drive and independent center and rear axle suspension. RANGER 6X6 EFI drivers use its Switch-Engaged On-Demand, true 6-wheel shaft drive to quickly and easily adapt to changing terrain and loads. Polaris uses dealer and customer feedback to enhance its product lines and one suggestion that was consistently mentioned was the inclusion of a speedo. The RANGER 6X6 EFI also comes with an exclusive Polaris Lock & Ride cargo system to easily carry and organize equipment, gear and loose material. This system combines a redesigned, multi-functional cargo box and a full range of PURE Polaris accessories that attach in less than ten seconds. The cargo box is big enough to hold a standard pallet, has drain holes for wet material and comes standard with a pickup truck style tailgate and self-cleaning hinge for dumping loose materials.